Chatterbox Chipmunks, I’ve been lied to. There’s no way I’m turning 30 in April. I can’t remember much from those early years, so for all I know, life began in 1986 and not 1982 like my birth certificate would lead you to believe. That’s right. I’m not a day over 25. My taste in accessories (slap bracelets) and hair styles (side ponies) suggests not a nostalgic fondness for the styles of my youth, but rather a hipster-esque desire to embrace ‘vintage’ trends. Remember Christie? 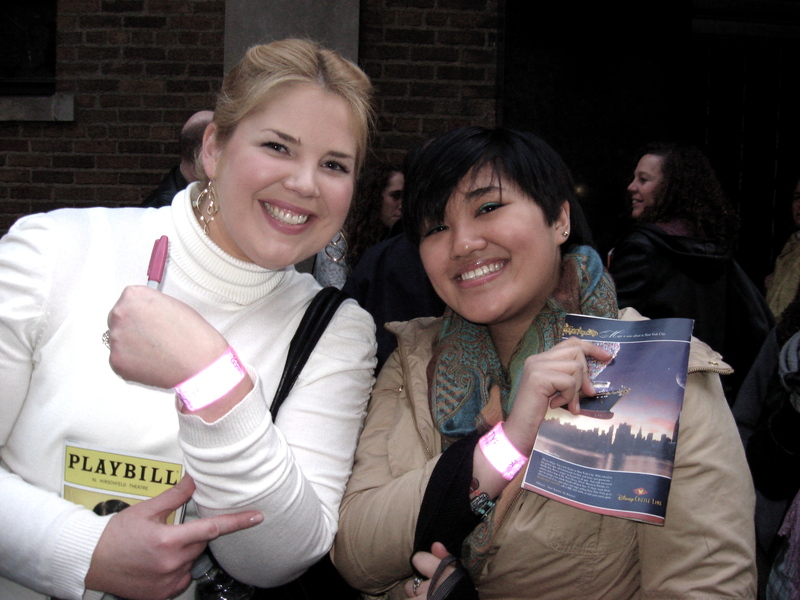 We met two weeks ago cavorting outside the “How to Succeed in Business Without Really Trying” stage door, exactly the way smart, funny, adorable girls in their early twenties meet. Christie is as sweet as a teeny, tiny baby chipmunk and attends a crazy-good school to study architecture. 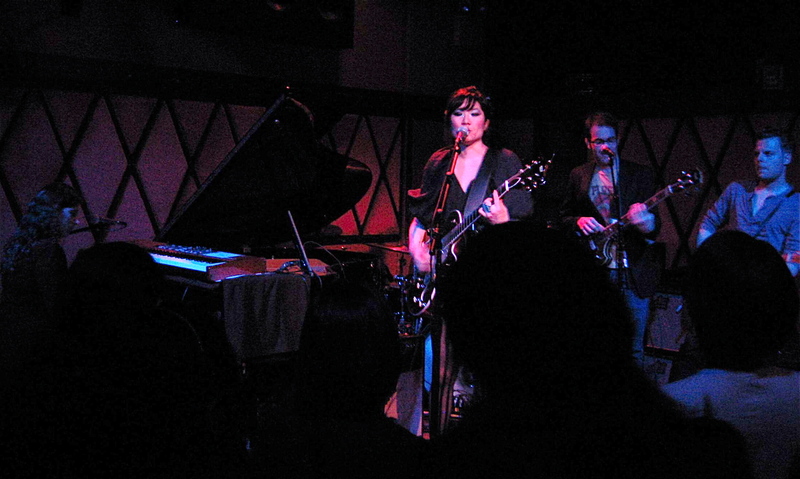 We met up this past Thursday in lower Manhattan to see my fellow 25(ish)-year-old, Charlene Kaye, perform at the Rockwood Music Hall. I wore a $4 white thermal shirt from Old Navy. You know, ’cause us young kids just don’t give a shiz*. The guy who carded me even said I was “a baby.” Now, I won’t be greedy. I’ll settle for 25. That was the highlight of the night. Charlene Kaye was brilliant, and managed to fill the venue, despite playing a 7pm set on a Thursday night. She performed for a mere 45 minutes, which is my only complaint. Charlene’s voice is pure and unique – both haunting and comforting. She can incorporate hip-hop beats into her music just as easily as power ballad piano riffs. I'm a terrible photographer, but I think you can still see that Charlene is the cat's pajamas. We said hello to Charlene after her set (there were high-fives exchanged…they have become cool and hip, so naturally I was included), and she asked if she’d see us again. Sure, Charlene, we’ll be at your CD release party in March – if I’ve finished my term paper I’m not too tired after work to make the commute. *Until said young kid arrives home and realizes her tanning lotion has rubbed off on the sleeves. What age do you want to relive so badly it makes you cry into your orange-stained sleeves? Next postDo You Want to Know My Secret? it’s nice when you reach the age when looking younger than your actually number is a good thing, isn’t it? as for the age i would like to relive… how about the roman-era age, like from the movie Gladiator. Is that what you were asking? Because i don’t want to relive any of my life experiences. i’m a move-along kinda gal. 🙂 great post and photos! You shall always be a decade younger than I, my dear! It’s better to *be* older and *look* younger than your peers. That’s how I roll! Love the Charlene Kaye song! Christie kind of looks like her. Whatever drugs they gave you when you were having me, do they still make them? I sure hope so. 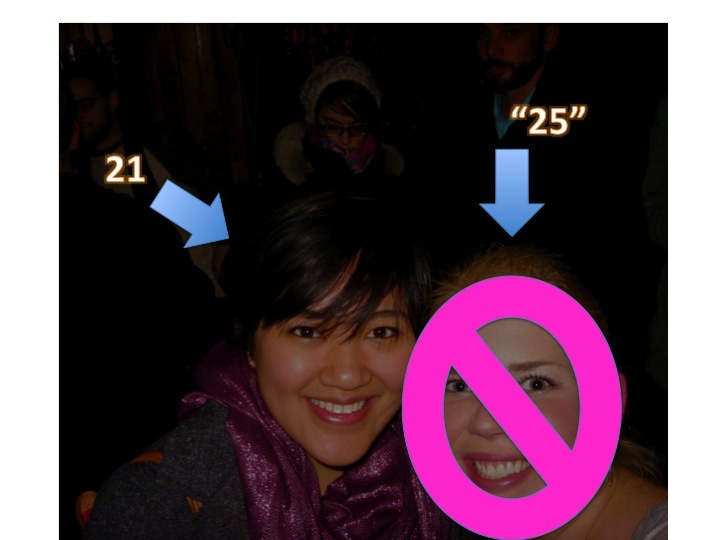 You don’t look 29 at all. And…you can come hang with me and still be the young one if you want. I turn 31 in June. YIKES! Keep talking like that, Thoughtsy, and you will have a smiley blonde girl crashing your birthday party. So you met somebody in line and became such good friends you’re now hanging out? You’re my outgoing idol – I want to be you (orange sleeves and all)! People often think I’m older than I am, sort of drove me crazy but now I’m used to it. When you know someone is married with two kids you assume they’re older than ALMOST 27. Speaking of which I celebrate my third 25th birthday on Saturday when I turn ACTUALLY 27. I always assume everyone is the same age as me and I’m still 22 in my head so you can be 22 with me. Happy Birthday, Marta! You will have to tell me all about it so that I’m prepared when I turn 22 in April. Second: You’re as young as you feel (for serious yo). Third-ly: I love that you’re smiley and stuff in every photo. First: I knew I liked you. Third-ly: You should see me when I’m drunk. I’m 44. Is it wrong that I want to relive a first kiss. I love my husband and all, but that anticipation of a first kiss. Le sigh. I would like to remember that again. And FYI: Thirty is waaaaaaay better than anything in your 20s. Keep wearing those slap bracelets, chipmunk! Not at all! I think it’s what us married folk miss – that anticipation! And I don’t think anyone could wrestle these slap bracelets away; not even out of my cold, dead paws. I am getting up there also in age.. You are a few months ahead of me, but I am more worried about what my friends are planning for my 30th! That is one of those parties that people tend to overdo.. Though it should be fun! Glad that I am not the only one with anxiety about hitting the big 3 – 0! You are young, you look gorgeous! 30 was wonderful and 40 was just fan-freaking-tastic. Really. I’m being serious! The older I get the more I enjoy life and don’t sweat the small stuff. Hell, sometimes I don’t even sweat the big stuff. An age I’d like to relive (if I had to choose…) would be 27 because that was the year I met my husband. Oh, and when I was seven. I was all about climbing trees, riding bikes and playing hide-n-seek outside. Good times! Thank you, Darla! 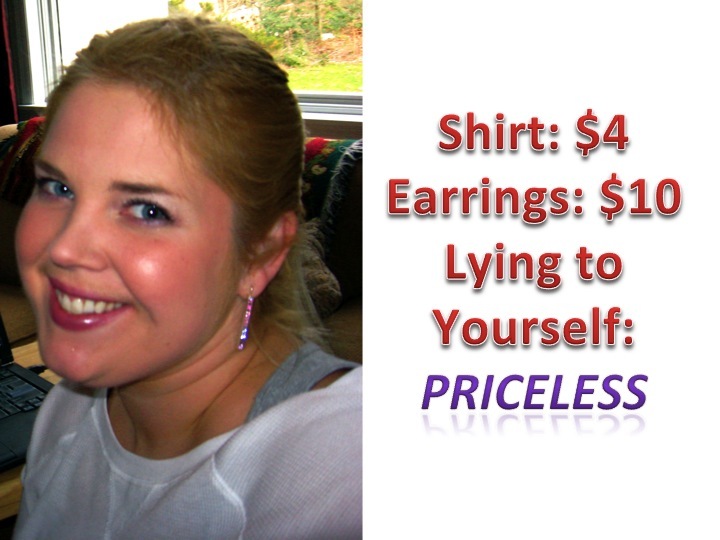 That is wonderful to hear, on all counts (I’m not too crazy about these pictures of me on this post! But I suffer for my art *snort*)! You and I would have gotten along splendidly at 7. My mom had to bribe me indoors for dinner every day! Deb, I made you a rose*, 'cause that's how I roll. *I even snipped the thorns.